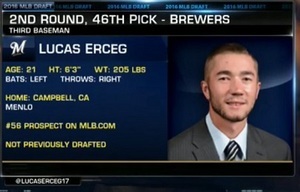 Former Neptune Beach Pearl Lucas Erceg was drafted in the 2nd Round with the 46th overall selection in the 2016 Major League Baseball Draft by the Milwaukee Brewers. This marks the highest a former Pearl player has ever been selected. Erceg a member of the 2015 Pearl was a key contributor en route to the Pearl winning the 2015 California Collegiate League Championship. Erceg's most memorable moment came in the CCL playoffs in an elmination game against the Conejo Oaks where he hit a game tying Grand Slam to save the season in the Top of the 9th inning to make the score 6-6 in a game the Pearl eventually won in 13 innings.